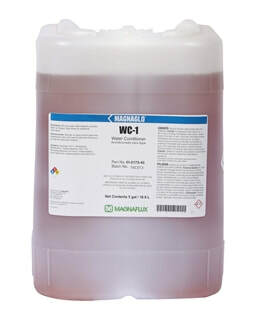 WC-1 is an excellent general-purpose water-conditioning liquid designed specifically to enhance surface wetting and magnetic particle dispersion stability in water-based magnetic particle suspensions. Its unique blend of wetting agents, corrosion inhibitors, and anti-forming agents eliminates the need for additional water conditioning agents. And as a liquid, WC-1 is easier to mix into solution than powder conditioners, especially when mixing into hard water.